A shooting overnight in St. Louis has left two people dead, one hospitalized, and a St. Louis Police officer wounded. Police say what began as a fight between a boyfriend and former boyfriend turned into a fight over a gun. One man and the woman the two men were fighting over were fatally shot. Another person was shot and last reported to be in critical but stable condition. St. Louis Police Chief Sam Dotson briefed reporters after a shooting that left two dead, one hospitalized, and one of his officers wounded in the leg by a ricochet. 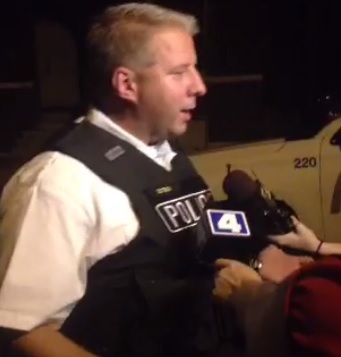 St. Louis Police Chief Sam Dotson said the suspect shot at police as they arrived. “At least one shot struck the police car. There’s ballistic damage to the passenger side door on the lower edge. There’s a police officer that was struck by a ricochet shot,” said Dotson. The officer returned fire but the suspect was not hit. The officer is said to have about four-and-a-half years of service. Dotson said the suspect was caught a couple of blocks from the scene. He has a criminal record and was described as well known to the neighborhood where the shooting occurred. Dotson said such incidents are occurring too often. After five police officers were fatally shot in Dallas last week, Dotson ordered that his officers respond to calls in pairs. Dotson said that will continue for some time. As of shortly after midnight, Dotson said police were still looking for the suspect’s gun.